This is our third post in our Fashion to Flowers series! We really love this column on our blog because it encourages us to think more widely about flowers and their personalities, rather than only focusing on what we’re working on in the studio. Last week, the fashion inspired the flower but today the flower definitely inspired the fashion. A few weddings back, one of our brides used parrot tulips in her corsages and bouquet, and I fell in love. Seriously, parrot tulips are my new favorite. Each flower looks hand painted and put together in a crafty way. 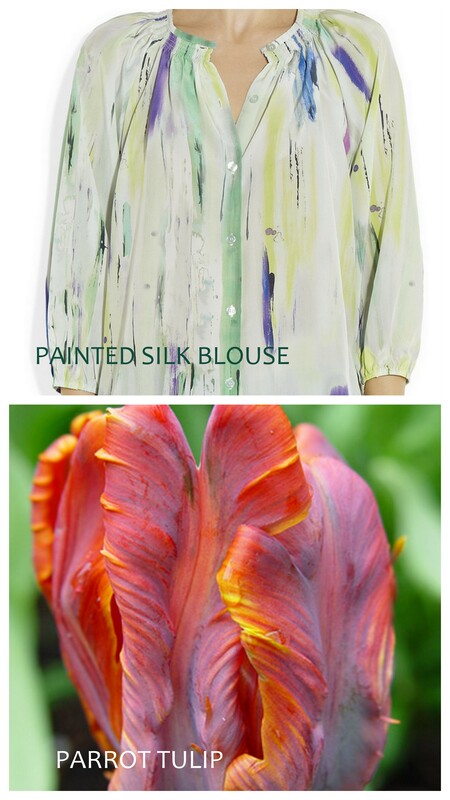 Our gal wears this painted silk blouse on a Sunday stroll as the season changes. Maybe she is out to brunch with girlfriends and then the farmer’s market. She’ll pick up some parrot tulips and display them on her sunny kitchen table.